I have finally obtained permission for Rick and me to stay in park housing in the Tambopata National Reserve. It costs $6.00 per night, so perhaps it was worth the trouble (still debatable). I haven’t kept an exact count, but I believe I visited the Tambopata office over a dozen times in the last two weeks in an effort to obtain the necessary permits. A man named Ernesto has been assigned to help me. He looks up with a bemused, half-annoyed grin each time I enter the office. I huff and puff in an effort to show my exasperation with the process and quickly realize I am wasting my breath. He finds something wrong with the documents each time I bring them over. The sentence usually begins “Um, Senorita, I was wrong . . .” and then I have to change some critical part of the document. Thank goodness I’m only asking to take pictures – I can’t imagine how difficult this would be if I actually wanted to collect insects or plants! In any case, he was helpful, albeit in a slow and protracted kind of way. Now, we have an official document and we leave for Tambopata tomorrow. The first stop is El Gato Lodge and then we go on to park housing at Malinowsky. We have to bring food to the second site and have explored the two supermarkets in Puerto Maldonado. Slim pickings , but at least we will know the food doesn’t contain meat. Off to El Gato tomorrow! Back to the Blog: Field Season 2 Begins! As I have been getting a few emails like this lately . . . I decided that it is time to tell everyone that I am healthy and safe. In fact, I’m currently eating alfajores (delicious Peruvian cookies filled with dulce de leche) in a comfy hotel room in Lima. 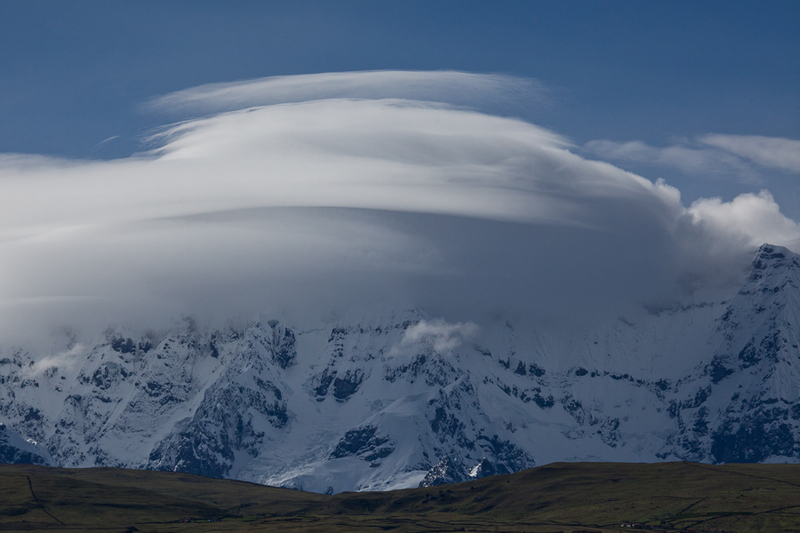 To give a more interesting answer, I spent two weeks in Ecuador on a vacation at a cloud forest lodge and have been in and out of Lima working on research and preparations for our four month field season. Rick and I were supposed to head out to Puerto Maldonado a few days ago to begin our work in Tambopata National Reserve, but we delayed our plans till April 9th because of some social and political unrest in the area. 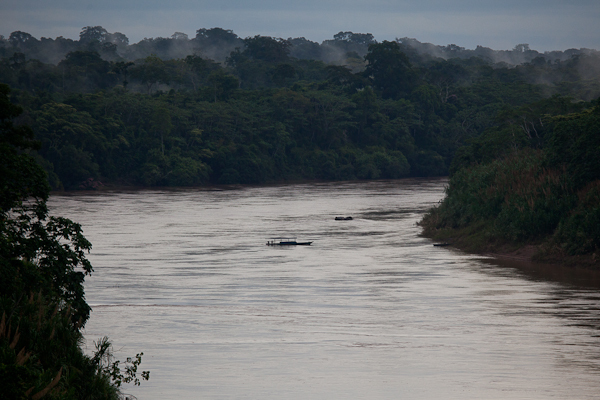 This unrest is related to illegal gold mining in the Madre de Dios Department. After years of pressure from environmentalists, the government has finally cracked down on the gold mining. With a very strong fist, they sent 1000 military personnel into the area in mid-February to blow up the largest illegal gold mining rigs (many are worth around $250,000). This has understandably upset the owners of the rigs and the people who work on them. The miners have been staging strikes over the last few weeks – one lasted 12 days and shut down all river transportation on the Madre de Dios River. Rick and I decided to lay low and wait till the trouble passed. Thankfully, it seems the government has reached an agreement with the miners and all should be back to normal (whatever normal means in the jungle) by the time we arrive on April 9th. Along the way, I will have a visit my aunt and her high school roommate and from two friends from South Africa. It should be a blast! In any case, my Lightroom library has now reached an astounding 17,400 images, so it is time I shared some with you all. 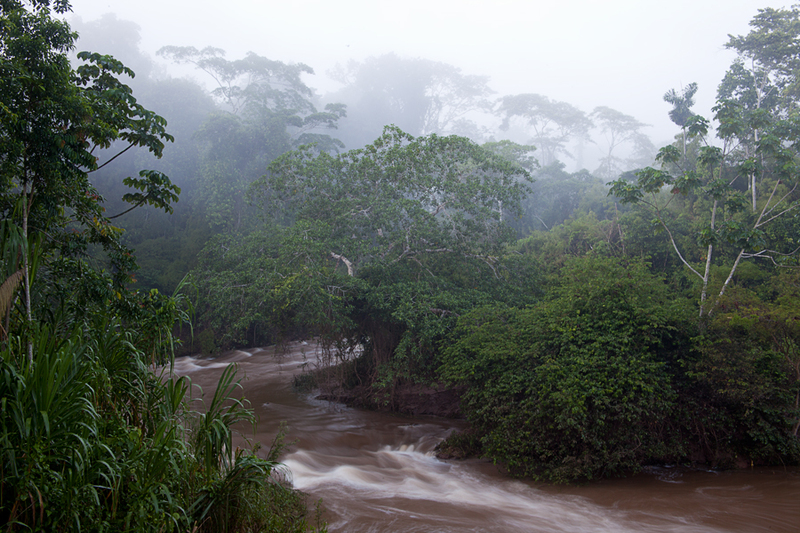 Enjoy my notes from our time in Tambopata from January and a glimpse into rainforest life. 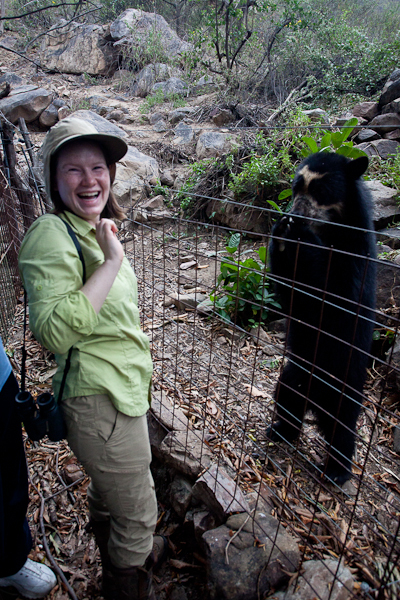 I’ll also post a few images from my recent trip to Northern Peru with Rick and his mom – we had a fabulous eight days. 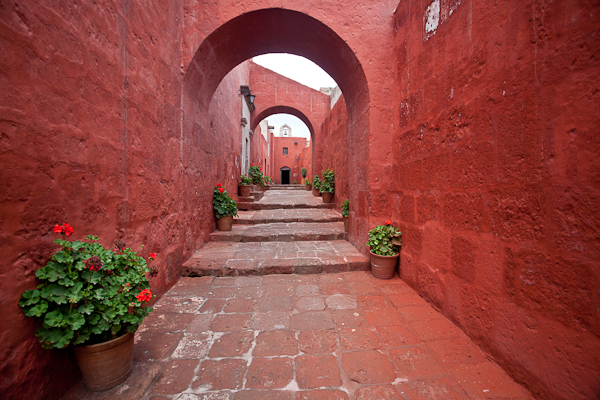 We split up the long trip to Lima from Arequipa with stops in Ica and Paracas. While the town of Paracas left something to be desired – a handful of tourist restaurants on the beach and beach strewn with trash – the Ballestas Islands were worth the trip. We stayed in a nice beach hotel in Paracas and walked along the shore the first night after arranging a tour for the morning. 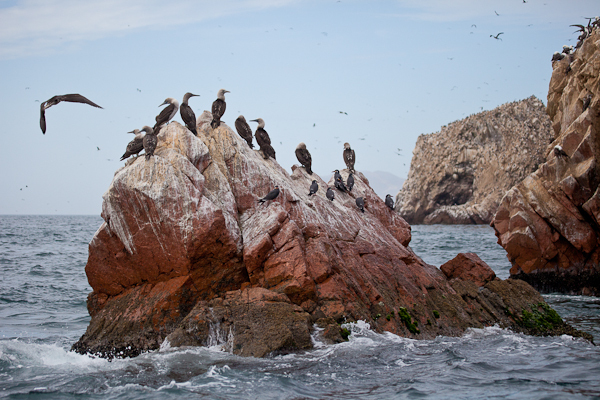 The birding was great – Peruvian pelicans, guanay cormorants, royal terns, and Inca terns lined the shore. After examining a few menus we sat down to dinner at a restaurant that claimed to have vegetarian options. Our ordering experience confirmed our belief that vegetarian does not signify ‘without meat’ in Peru – it only means ‘with vegetables.’ The vegetarian pizza was covered in ham. It is rare here that vegetarian dishes are meat-free and the pizza brought to mind the most ridiculous experience we had with vegetarian food. In Puerto Maldonado, we ordered rice and beans off of the vegetarian section of the menu (comida vegetariana) and were presented with beans that had pork in them. When I pointed out the fact to the waitress, she replied, “it’s not the meat, it’s only the skin.” We had a light dinner that night. After our dinner we saw a spectacular sunset and went to bed early for our trip to the Ballestas Islands at 8am. We arrived at the tour agency and were led by a scurrying old man to the dock where we met at least 100 other tourists. We were filed onto a large boat and given lifejackets. The trip out to the islands took 30 minutes. I had been hiding under a poncho because the ocean spray was constantly hitting my face. 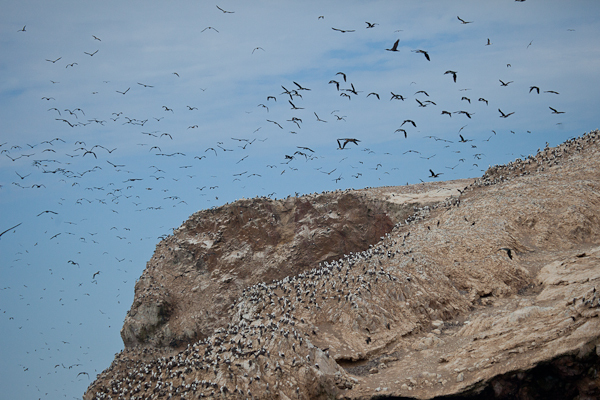 I emerged to find a spectacular view of rocky islands coated with birds. There were thousands and thousands of gulls, cormorants, and boobies moving in waves over the islands. Inca terns swooped by the boat, their feathered moustaches waving in the wind. We circled the islands and saw the birds, sea lions, and Humboldt penguins. 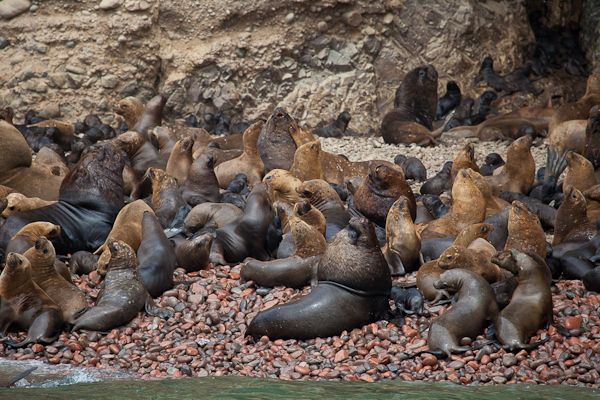 The sea lions gathered by the hundreds and the large males fought ferociously on the shore. One large male bobbed up beside our boat and I was shocked by its sizeable girth. As we continued to circle the islands, Rick and I felt churning in our stomachs. The rocking boat combined with the overwhelming smell of guano made the ride less than pleasant. Image stabilization on the camera didn’t help – as the image inside the viewfinder shifted slightly each time I focused. We circled the islands for another 20 minutes and returned to the open water, relieved by the fresh wind. 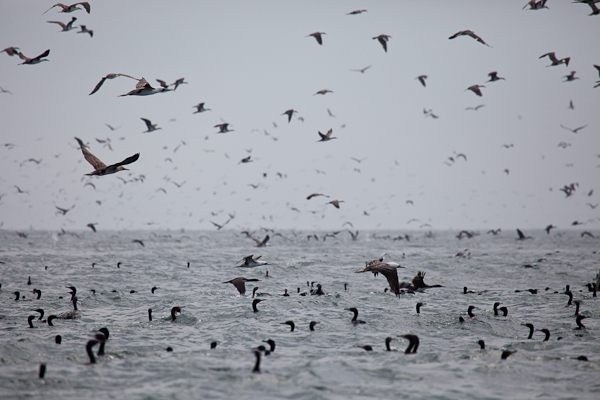 On the way out we passed an enormous flock of cormorants and other seabirds flying over the water. We kept pace with them as the swooped and dove. The Ballestas were fantastic – a must-see when visiting Peru. A great trip, even with the guano. 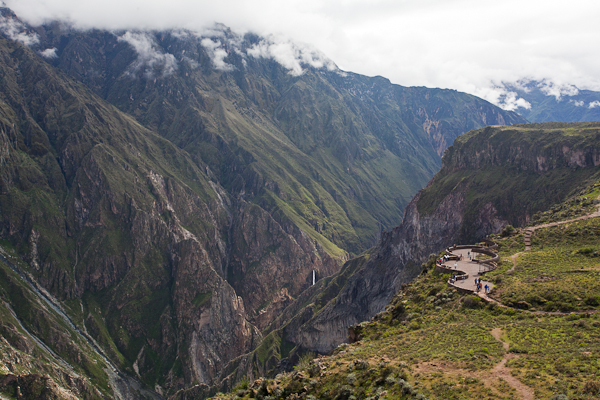 For us, Arequipa’s big draw was the Colca Canyon. The canyon one of the deepest canyons in the world at a depth of 10725 feet. 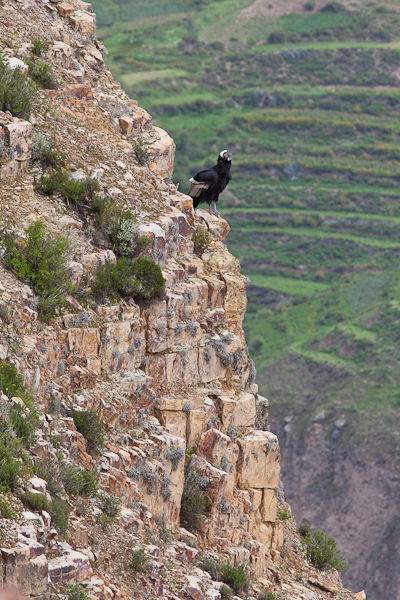 We stayed in the Colca valley for two nights to see the canyon and the Andean Condors that are common there. In an uncharacteristic move, we decided to go on a group tour and while it had its advantages, we were sad to be pulled away from Chilean Flamingos and vicuñas more quickly that we would have liked. The tour started with a drive to the canyon (about four hours) with multiple stops along the way to see flamingos and vicuñas. 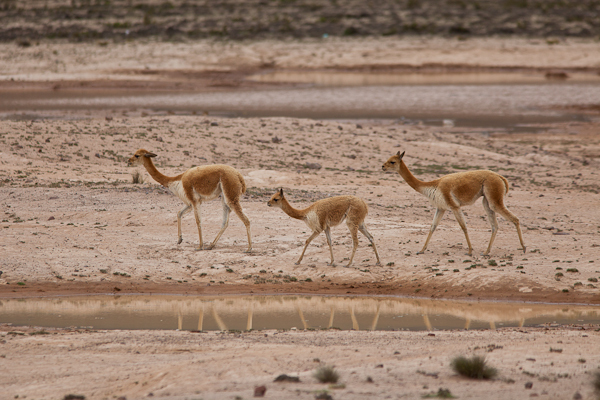 Vicuñas are one of two wild species of South American camelids. 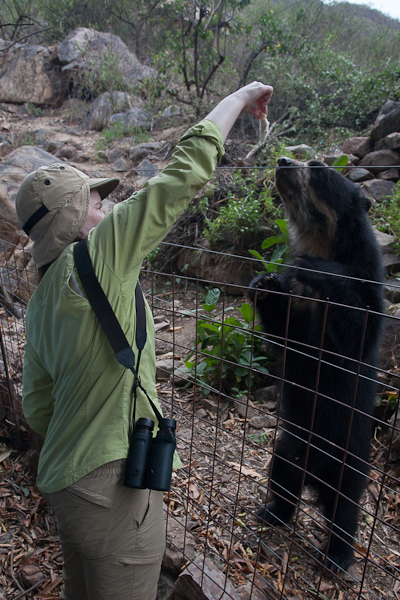 They were highly endangered in the 1970s, but have now recovered in numbers. We were able to observe them from the side of the road and watched as they grazed on the high plains. We also saw Chilean flamingos and a number of other high elevation birds (giant coots included) in the puddles along the road. 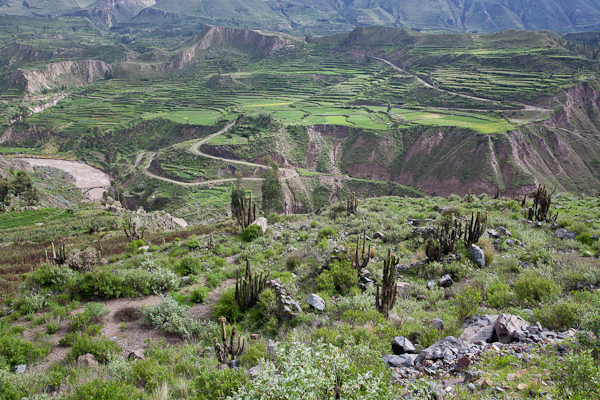 We arrived in the Colca Valley in the afternoon and were taken to a hotel nestled at the foot of a terraced hill. The evening was spent on a trek to some old ruins and a dip in the hot springs. The rain followed us to Arequipa and we hiked while drenched and felt the contrast of cold rain on our heads while bathing in the hot springs. 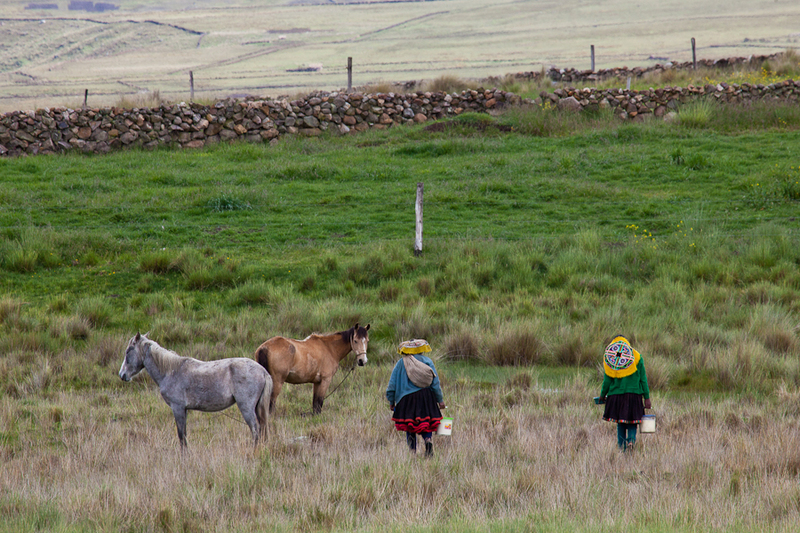 The next morning we were picked up at 7am to go to the Cruz del Condor – a spot famous for seeing the Andean condor. The Andean condor is the second largest bird in the world in terms of wingspan (second only to the wandering albatross). Three condors swooped above us with 15 minutes of our arrival. They are spectacular and my 300mm lens was almost too long. They were gone in a few minutes and we were left to enjoy an extraordinary view of the canyon and to sip our hot cocoa tea. 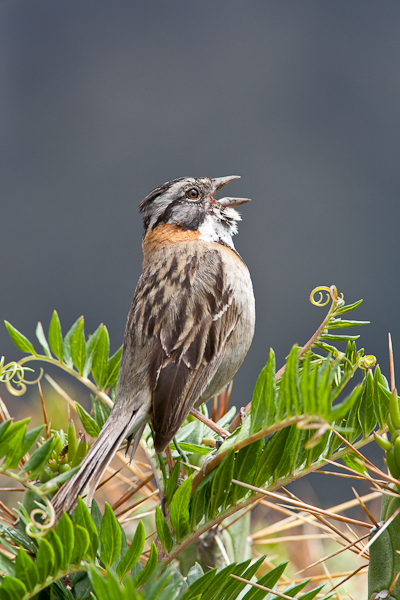 We spent the evening relaxing and birding and returned to the Cruz del Condor again the next morning. When we arrived the view was completely obscured by thick fog. You couldn’t see a thing and we both felt sorry for the tourists who only had one shot to see the condors. Fortunately our guide knew another condor spot and we found four adults circling at close range. We returned to Arequipa for two nights and then took a bus on to Ica, a Peruvian city made famous by its wines and piscos. Rick and I have taken a few weeks off from our project because of the heavy rains that are currently pelting Cusco and Puerto Maldonado. At the beginning of February, we opted to leave the jungle because the humidity and the mosquitoes had reached an all time high. Februrary is the rainiest month of the year and we found ourselves drenched and itching during our last stint in the field. Rick had 200 chigger bites on his back at one count. Believe it or not, both of our camera bodies are still functioning (with occasional metering issues). 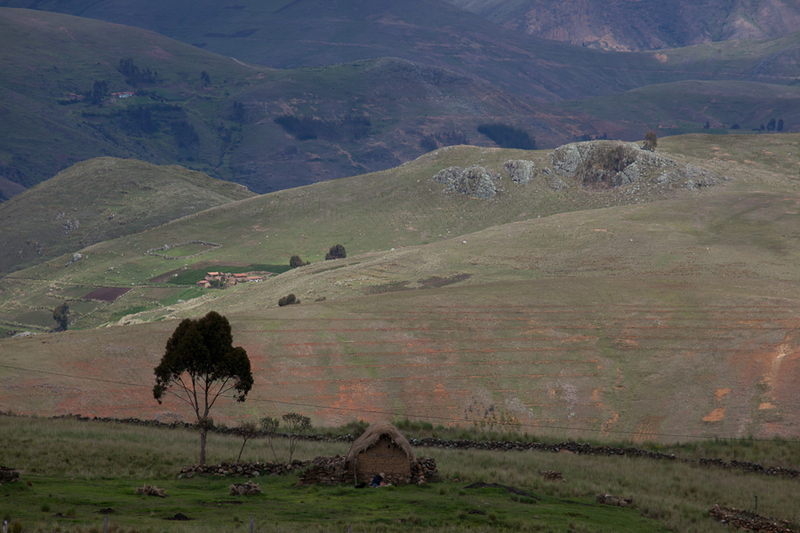 We headed back to Cusco to plan the next leg of our journey and were informed that Manu Road, our other major work area, was wrought with landslides. Last year the road was closed for all of February because entire sections of the road were swept off the mountainside. We decided it was just as well to wait till June for that part of the project. So, we ended up in Arequipa, Peru for a few days – also known as “the White City.” The name comes from sillar, the volcanic rock used in most of the architecture. You can see the fingerprint of Spanish colonialism around every corner. Aside from the palm trees in the Plaza de Armas and the women adorned in traditinal Andean dress, you’d think you were in Europe. We spent the first two days visiting the local museums and sites – the highlights being the Santa Catalina Monastery and the Museo Santuary. 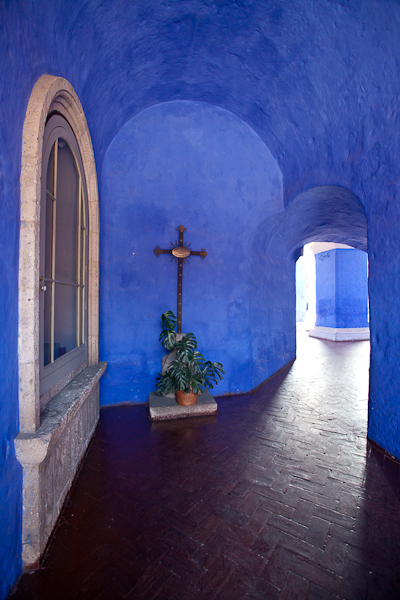 The Monastery was delightful – a photographer’s dream. It was only recently opened to the public (1970s) after over 300 years of isolation. It occupies a number of city blocks and is a labryinth of nun’s quarters, fountains, and hidden courtyards. 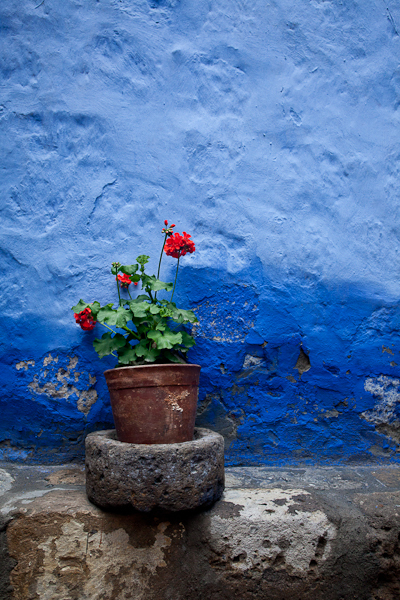 I was impressed by the beautiful colors of the walls and the perfectly landscaped scenery. If you had to be cloistered – this would be the place to do it. I was also amused by the display on barbed wire undergarments that were used by nuns to atone for their sins. We also visited the Museo Santuary, which hosts Juanita, the Incan Ice Maiden. 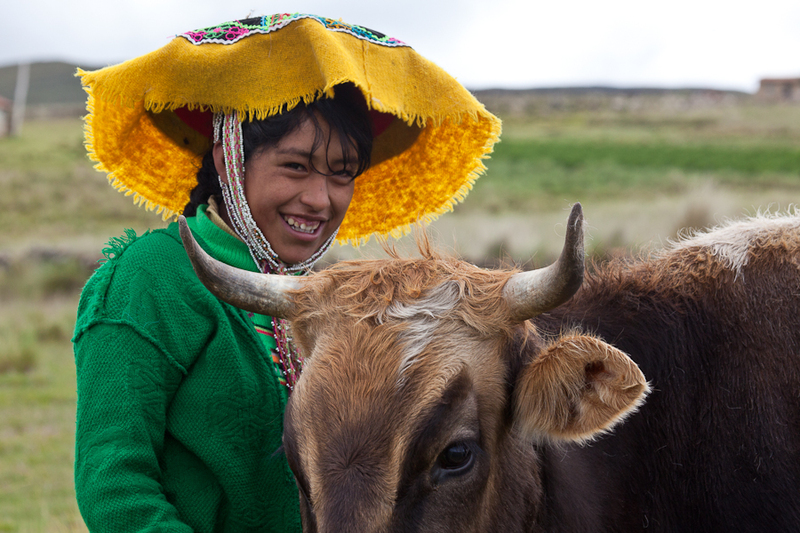 Juanita was a sacrifice given to a volcano to stop the volcano from erupting. She was recovered a few decades ago in perfect conditions (even her organs were still intact) when a scientist was studying volcanos near Areqipa. Over ten other child sacrifices have been discovered on other volcanoes in Peru and one of them was on display in a freezer in the museum. The history was fascinting and there is a National Geographic Documentary on Juanita if you are interested. As part of our project, we are working in the Tambopata National Reserve – part of the Manu – Tambopata Conservation Corridor that protects land around the Interoceanic Highway. All transport to and from the reserve is by boat and this section of our trip proved to be the most difficult to plan. There are no official research facilities in the reserve, so we had to be creative. Our final plan for Tambopata was to work at the park guard posts, the lodges owned by Rainforest Expeditions, and – a gem worth mentioning – El Gato Lodge. We recently spent 8 nights at El Gato and 7 nights at the Malinowsky Park Guard Post in Tambopata National Reserve. The next few entries will recount some of our adventures during this time. 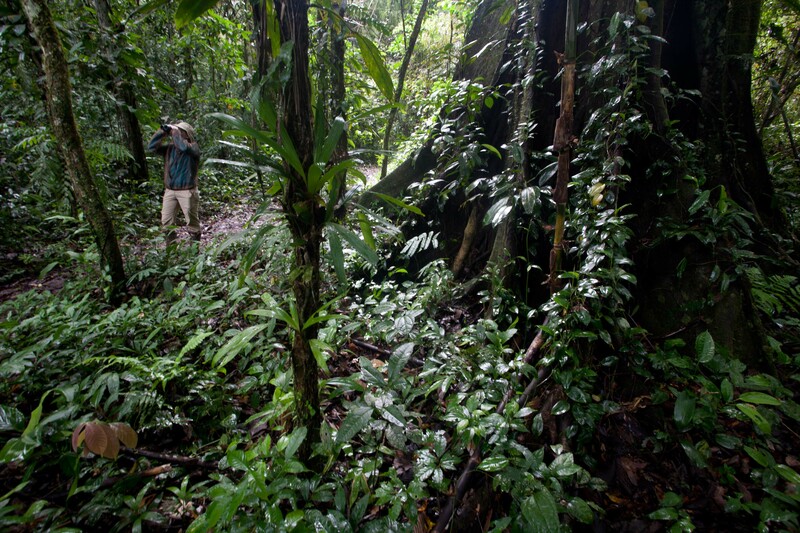 We return to the area in April to work with Rainforest Expeditions! El Gato Lodge is owned by the Ramirez family. They have an agricultural concession on the banks of the Tambopata River, but have decided to preserve it for ecotourism rather than developing it for agriculture. 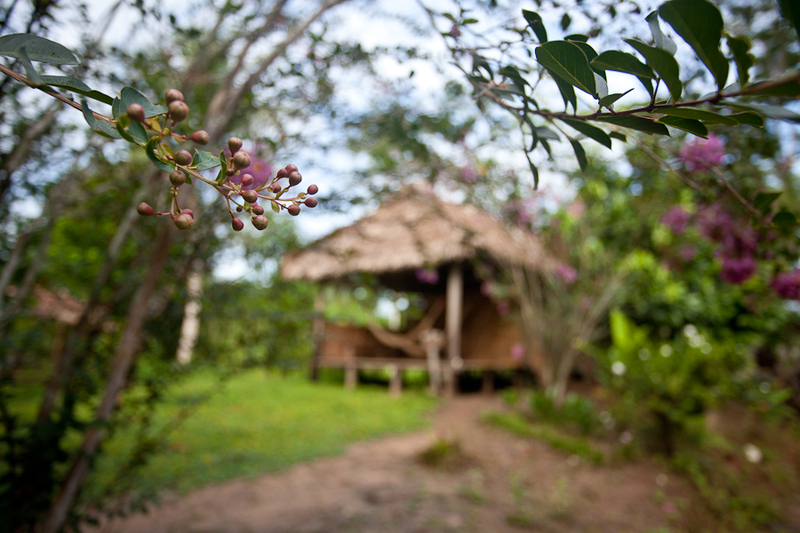 With 3 rustic cabins, they offer an affordable alternative to the luxury lodges, and a complete jungle experience. Their property is located in the reserve zone of the Tambopata National Reserve and some of their trails spill over into the reserve itself. Rick and I stayed there for eight nights and had a blast. Three meals a day and lodging in a private cabin costs S/65 per person per day (around $25). We’d recommend it to anyone. One of the highlights was our adventure at the clay lick. We left the lodge at dawn and arrived at the bird blind at 6:00am, just in time to see hundreds of parrots descending on the bank. Blue-headed parrots, orange-cheeked parrots, and mealy parrots flew back and forth between the trees and the bank, fighting for space on the clay. After a few hours, the parrots departed and over 30 macaws swooped in (red and green, and scarlet macaws). We also had a lot of luck with herps – a handful of incredible frog species and a spiky lizard. 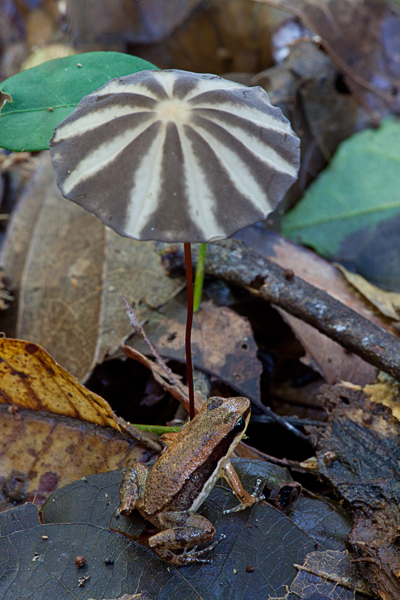 We found three species of poison dart frogs and were able to observe two species calling. More on this soon – for now, a few photos! El Gato Lodge - One of the Rustic Cabins.